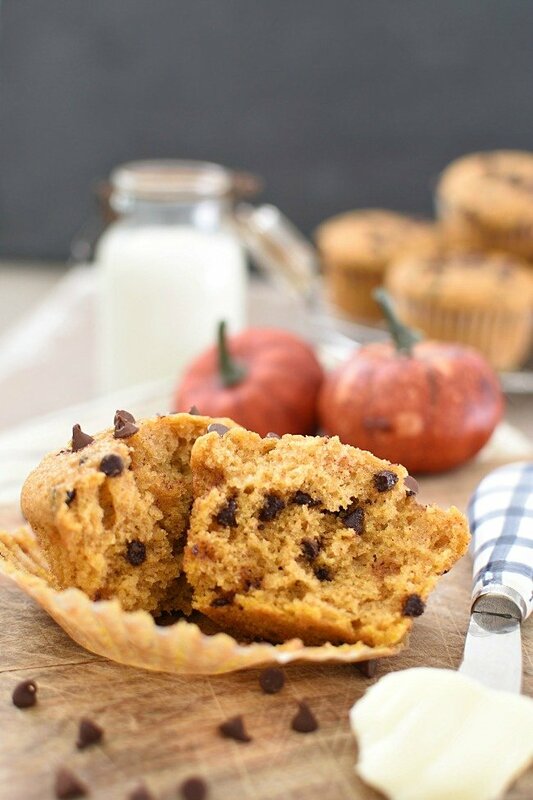 Chocolate Chip Pumpkin Zucchini Muffins are extra moist muffins, full of pumpkin spices, and studded with plenty of chocolate chips! 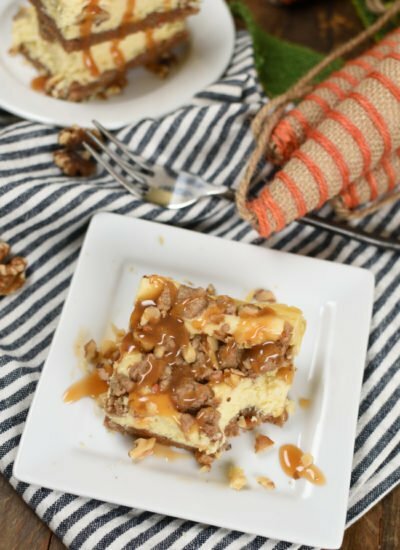 Double this recipe and stick a few dozen in the freezer for breakfast, brunch, snacks, or even dessert later on! I have a question for you guys today! Are you still eating zucchini, or do you limit your zucchini recipes to the summer? I’ve been seeing a bunch of Thanksgiving zucchini recipes popping up and to be honest I’ve never eaten zucchini for Thanksgiving. Zucchini is one of those veggies I add to about everything possible when it’s overtaking my garden, then when it freezes and it’s over I move on to other obsessions. Please leave me a comment below and let me know! Food nerds want to know this kind of information! Like I said I’m not technically in zucchini mode right now, but I had a few zucchini’s left in my fridge so I turned them into the most incredible Chocolate Chip Pumpkin Zucchini Muffins! 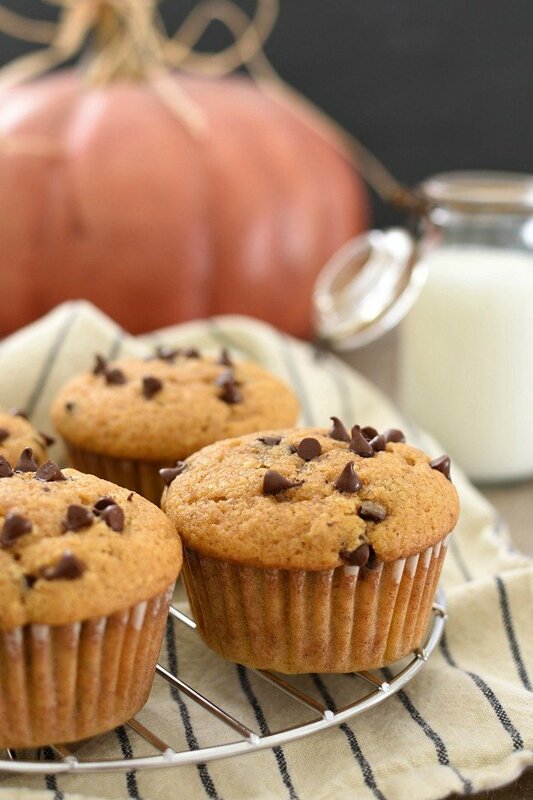 These muffins are ultra moist, because hello pumpkin and zucchini! 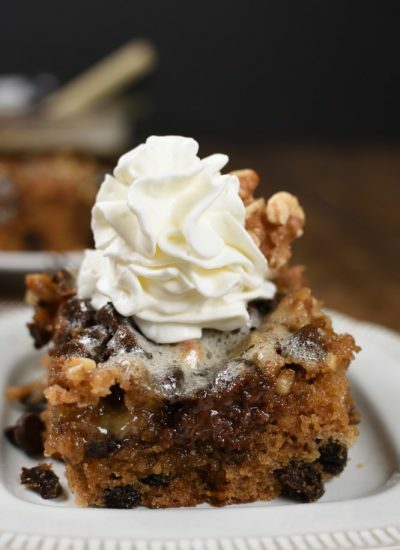 If you didn’t want to add chocolate chips to them you could always add walnuts, raisins, or a streusel topping to the muffins. But, who wouldn’t want chocolate chips? In my Zucchini Breakfast Cookies recipe, I shared tips on shredding zucchini. Although shredding zucchini is the most popular way to prepare zucchini in baked recipe, I’ve learned a little trick to make that whole process even easier! Because fast and easy is the name of my game. It’s how I survive from day-to-day! Have you ever tried pureeing zucchini in a blender? Well, it works wonderfully! It beats the heck out of wasting time grating zucchini and risking grating the skin on your thumb right off! Okay you guys, you can’t always take the lazy route and blend zucchini in recipes. I’m not going to guarantee success with ever single recipe you try. But, I’ve never found a zucchini quick bread/ muffin recipe that it didn’t work for. I’m guessing it would work in cakes too. 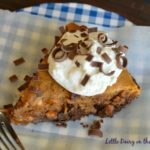 It works like a charm for Zucchini Picnic Cake, Zucchini Texas Sheet Cake and these Chocolate Chip Pumpkin Zucchini Muffins. 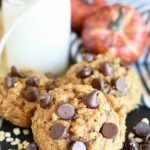 I haven’t tried it in zucchini cookie recipes like Chocolate Zucchini Cookies or my Zucchini Breakfast Cookies because I’m afraid it will add too much moisture before baking and seriously change the consistency of the cookies. If I try it I’ll let you know how it goes! 1 cup shredded zucchini equals 5/8 a cup of zucchini puree. So, if the recipe calls for 1 cup shredded zucchini you need 1/2 a cup + 1/8 a cup of zucchini puree. Got it! 2 cups of shredded zucchini = 1 1/4 cup zucchini puree! See we are actually using all that 5th grade fraction practice! Do I need to peel zucchini before using it in baking? Good question! Let’s go back to the whole fast and easy is the name of my game theme! Leaving zucchini peel on will not affect the texture or taste of baked goods at all. So, peel if you’d like to and don’t mess with it if you don’t feel like it. How do I decide? If I’m grating zucchini I almost always leave the peel on, unless I don’t want the darker green specks in my baked goods. You’ll never see the peel in chocolate zucchini baked goods. Even in pumpkin zucchini muffins the peel doesn’t bother me if I’m going to shred the zucchini. However, if I’m blending the zucchini it will change the color of the muffins if I leave the peel on. The puree will be darker, and when it gets mixed with orange pumpkin it creates a kind of ugly color. So, if the baked goods are light in color, like in these muffins, I peel the zucchini first. How do I use frozen zucchini in bread? Well, I’m not a great person to ask and here’s why! I prefer using fresh zucchini and freezing the baked goods as opposed to freezing zucchini and using it for baking later. 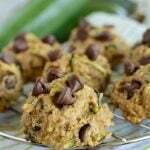 Every fall I make several batches of Chocolate Chip Pumpkin Zucchini Muffins and stick them in the freezer for later. 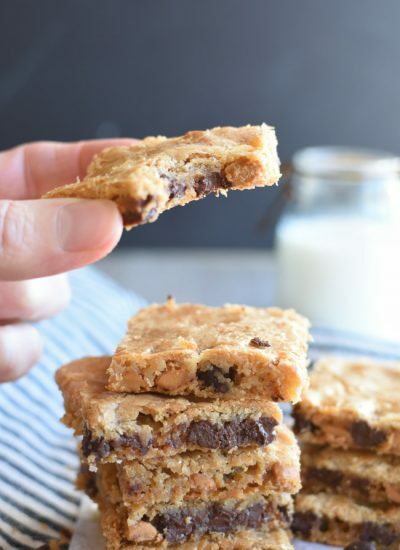 They are a lifesaver on busy morning, or when I need a quick snack or even dessert. If you’d still like to freeze zucchini you will need to shred it, add it to freezer seal-able bags, lay it flat in the freezer and let it freeze. When you’re ready to use it thaw it, let it drain in a strainer, and use it as you would use freshly shredded zucchini. Once again, this isn’t my favorite method, but I know lots of people love it! Can muffins be made into a loaf of quick bread? Yes! It’s easy to convert a muffin recipe into a loaf! Because loaves of bread are thicker they will need longer to cook through. Decrease the oven temperature by about 50 degrees. Expect to bake a loaf of quick bread for about 60 minutes. You might want to also move the oven rack to the center position in the oven. Depending on how many muffins you are making, and on how full the muffins will be will affect how many loaves of bread can be made from one muffin recipe. For most muffin recipes that produce 24 muffins you will be able to make one loaf and about 12 muffins. Be sure to bake the muffins for a shorter amount of time than the loaf! 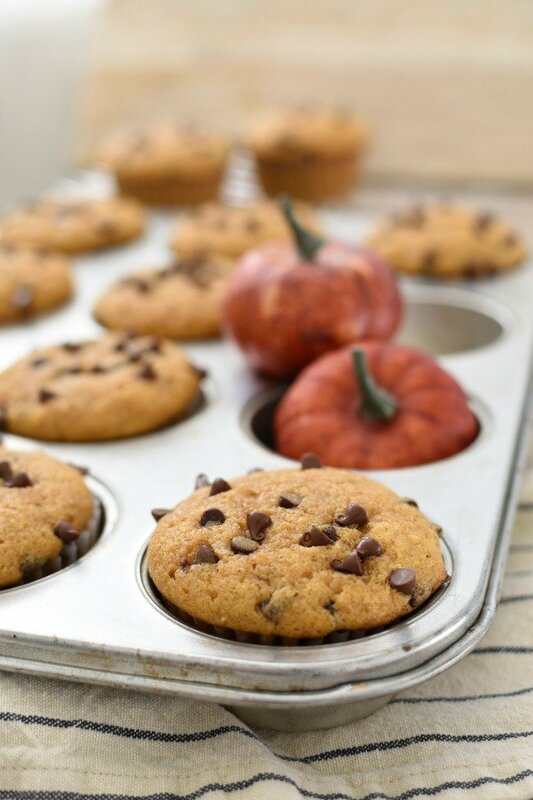 Grab the Chocolate Chip Pumpkin Zucchini Muffins recipe! 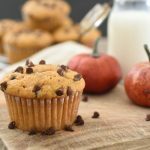 Chocolate Chip Pumpkin Zucchini Muffins are fantastic all by themselves, but they are out of this world when they are served warm with a little butter! Use real butter here…and everywhere else! Whip up a batch of these muffins and throw a few extras in the freezer for later! Trust me, there will be excited people when they get to enjoy one of these muffins on the dreary winter mornings ahead of us! 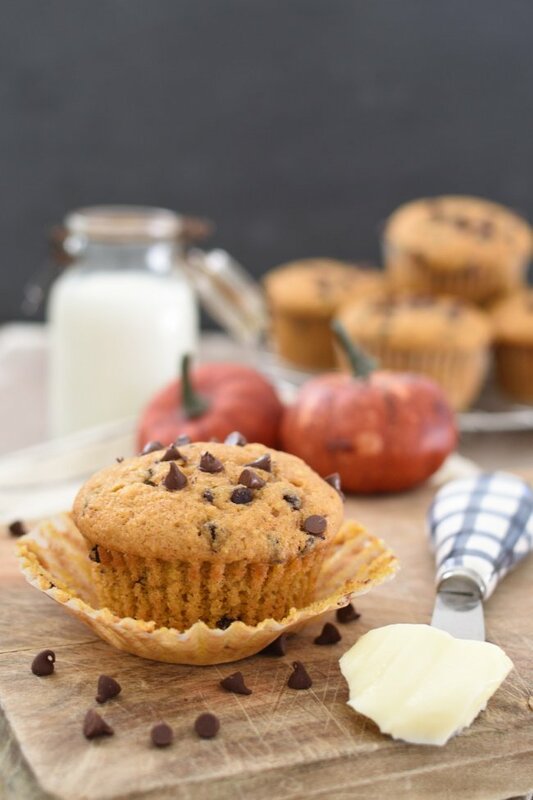 Chocolate Chip Pumpkin Zucchini Muffins are extra moist muffins, with cinnamon and spices, and studded with chocolate chips! Make extras and stick them in the freezer for later! Add pumpkin, zucchini puree, oil, and vanilla. Mix again. In a seperate bowl combine flour, baking soda, salt, cinnamon, nutmeg, ginger, and cloves. Gradually add dry ingredients to pumpkin mixture and mix until combined. Add chocolate chips and stir. 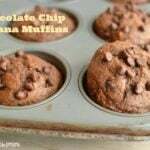 You can reserve a few chocolate chips to sprinkle over muffins if you'd like. Line muffin tins with paper liners. Fill 1-2 to 3/4 full. Bake at 350 degrees for 18-23 minutes. Test for to see if they are done with a toothpick. Cool in muffin tin for 5 minutes. Remove to a wire rack to continue cooling. Store in an airtight container for up to 3 days. Or freeze in a sealable bag for up to 3 months. My kids love them, especially for on the go breakfast or snacks! Oh my these look so tasty!! You can imagine how moist they are with pumpkin and zucchini! They hit the spot, that’s for sure! Oh yum!! 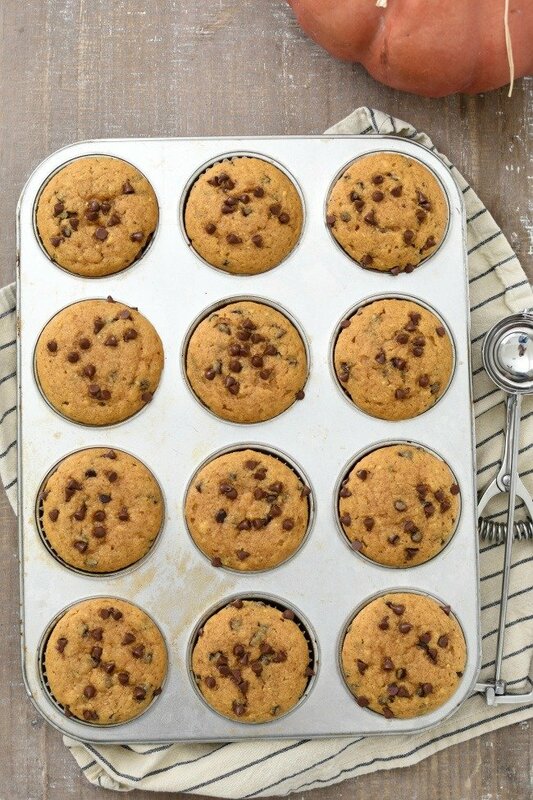 These muffins look and sounds SO delicious!! My kids would LOVE them! 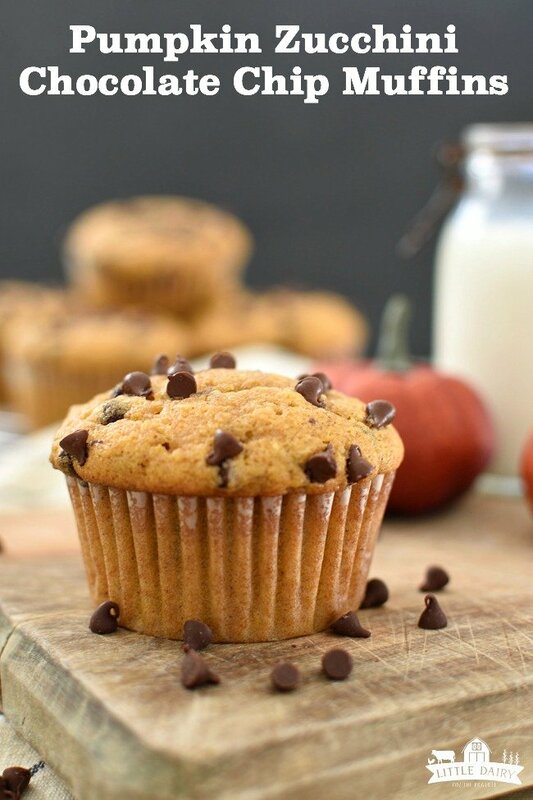 These muffins are my kids most favorite muffins of all! How inviting these muffins are! I need to try them! So warm and cozy! My boys go crazy for them! These are perfect day starter!! Would love to give this a try! Pulling them out of the freezer, warming them up in the microwave, and slathering them with butter is a perfect way to start the day! Enjoy! 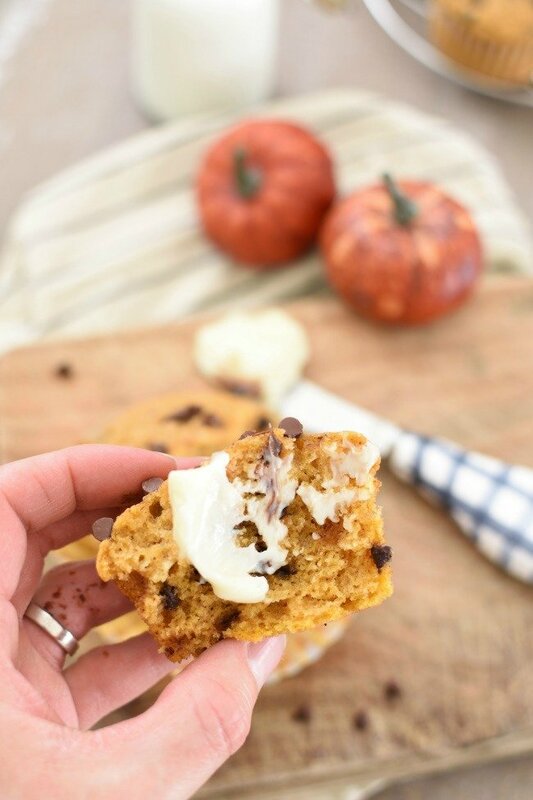 Oh my goodness my whole family would go crazy for these Chocolate Chip Pumpkin Zucchini Muffins!!! Yummy! This made me drool. Now, this recipe will be one of my favorites. Looks incredible! I hope your family loves them as much as mine does! I’m pretty sure they will! How yummy do these look! I have to bake them up asap! These look delicious and I’d love to make them today, but I have a question. The recipe calls for 2 cups puree or 1-2 cups shredded zucchini. If we use 1-2 cups shredded, wouldn’t we need about 1 cup of puree? Yes! Good catch Lynette! I just edited the recipe to read 1 1/4 cup zucchini puree! One cup of puree would also work just fine! Thanks for bringing that to my attention! Enjoy the muffins! 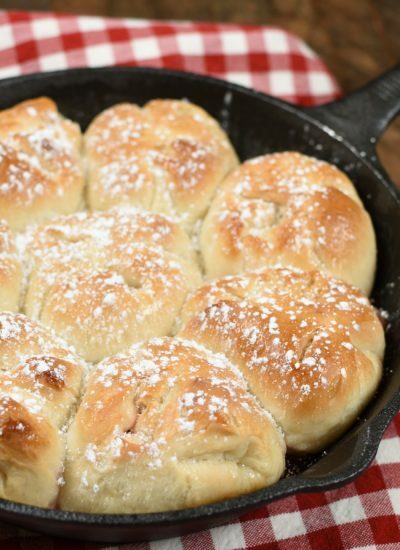 with whipped Greek cream cheese. you so much for sharing the recipe. of blended zucchini instead of grating it. Hi Ruth! I love that you were able to enjoy these muffins with your mom! Food has a way of bringing us together doesn’t it! Blending zucchini instead of shredding it is so much easier isn’t it? Thanks for stopping by! These are my favorite muffins – ever. I have made them at least 10 times now, I figured I needed to leave a comment!! One of my kids is extremely picky and I can get him to eat veggies via a chocolate chip muffin 🙂 Win-Win! I’ve made them the way you have them written here, and they’re delicious. I experiment with recipes too, and most recently have been adding a little bit of spinach puree to the zucchini puree (for a total of 1 1/4 cups still) and subbing the full cup of vegetable oil with 1/2c of plain greek yogurt and 1/2 vegetable oil. THANK YOU THANK YOU THANK YOU for this recipe. WE LOVE IT! Hi Maria! Your son is eating vegetables! I think most of us will eat vegetables there’s chocolate chips involved! Substituting Greek yogurt for part of the oil is a fantastic idea! Thanks for taking time to leave feedback! I’m glad you, and your family, is enjoying them!